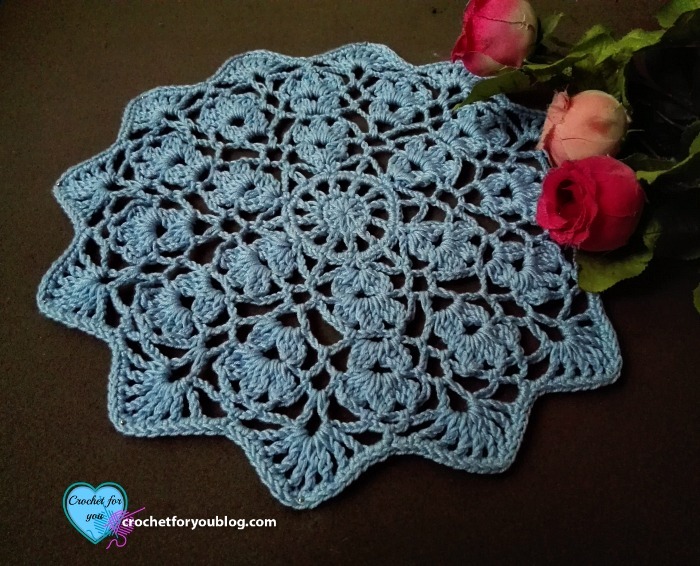 Flower Wheel Doily Pattern by Crochet For You. 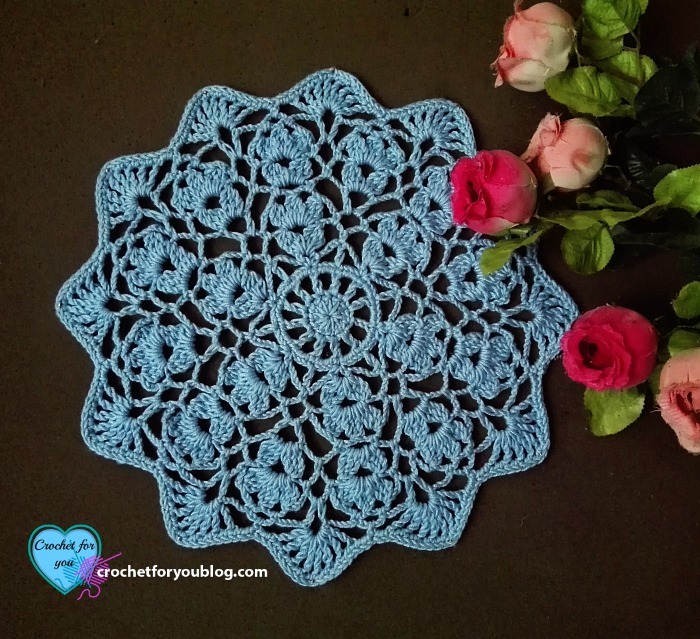 This time I came up with a pretty doily design. Flower Wheel Doily with blooming flowers around like a wheel. 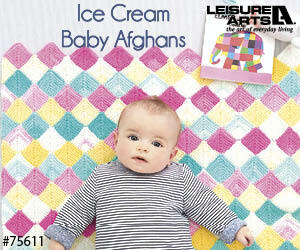 The pattern is easy and lacy. 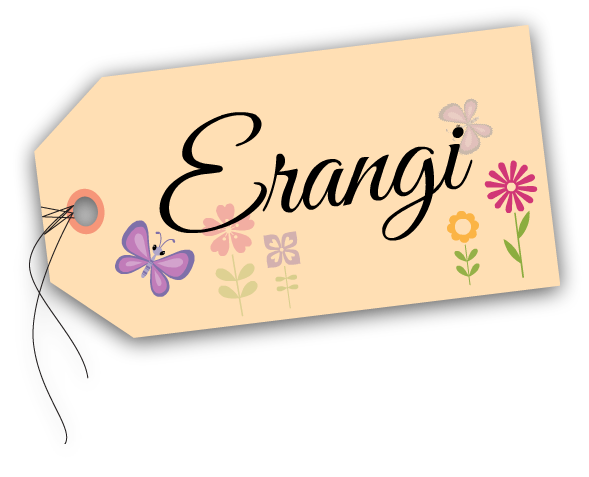 It is great for decorating your living room and add to spring feeling to your home. 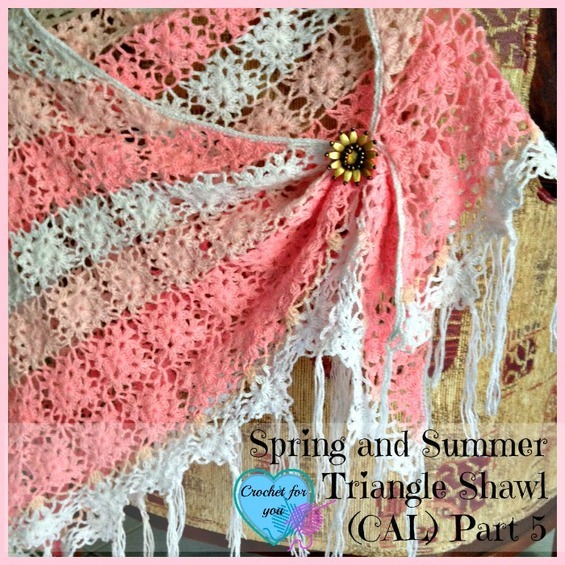 These flowers around the doily would look more beautiful with different color combination. Beg 3-Tr puff = ch 3, [yarn over 2 times, insert the hook in the same ch-sp, yo, pull up a loop, (yo and pull back through 2 loops) 2 times]2 times, yo and pull through all the (3) loops. 3-Tr puff = [yarn over 2 times, insert the hook in indicated st, yo, pull up a loop, (yo and pull back through 2 loops) 2 times]3 times, yo and pull through all the (4) loops. Fan stitch = (tr, ch 1, tr, ch 1, tr, ch 1, tr, ch 1, tr, ch 1, tr, ch 1, tr, ch 1, tr) in indicated st.
Notes: beg ch count as st. Round 12: ch 1, *2 sc in next ch-2 space, sc in each of every tr and ch-1 space of fan st, 2 sc in every ch-2 space; repeat * to around, sl st to beg ch 1. Fasten off and weave the end. 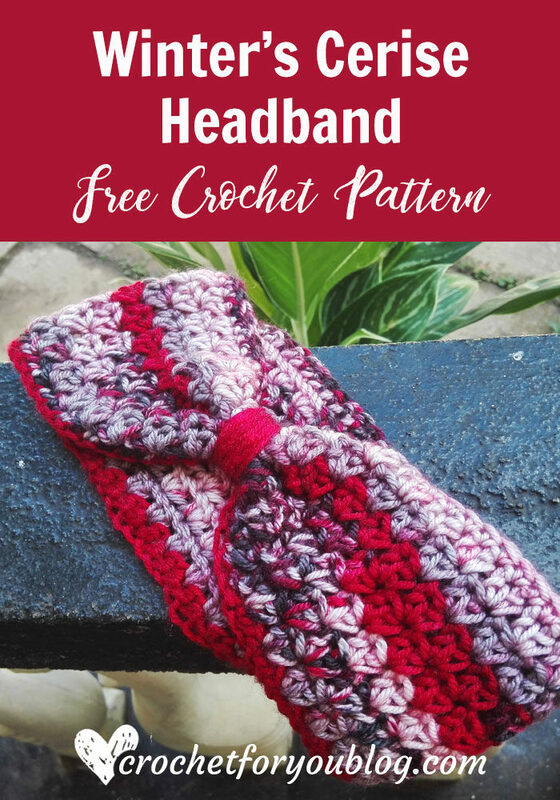 Thank you for the free pattern! Can’t wait to try it! Am I thinking wrong, or is Round 8 incorrect? After the first 2 sets of puffs it has you only putting a set of puffs in the chain 5 space, but I see it as you also have to put a set of puffs in the chain 6 space also above the set of 3 puffs from round 6. I checked the pattern once again, but I couldn’t find the error. 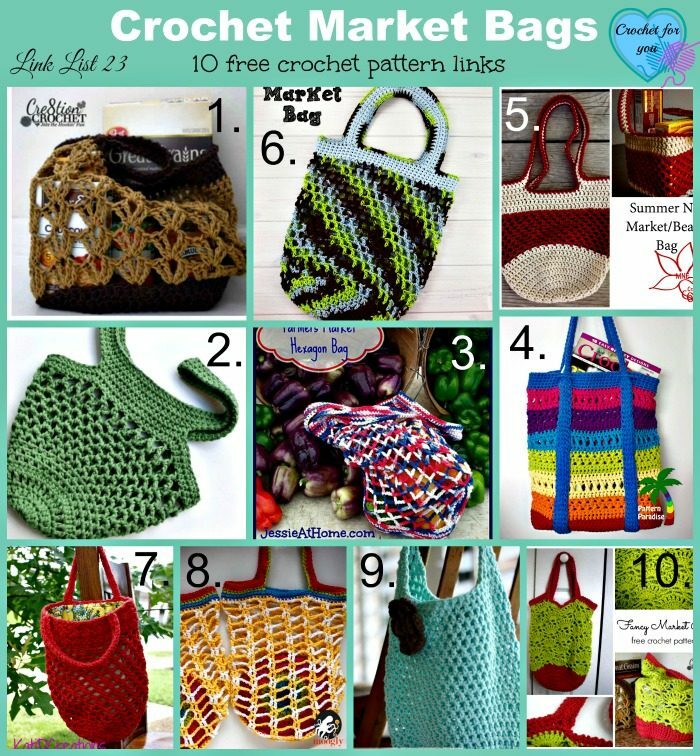 Please, if you tell me where you exactly stuck when crocheting the pattern, I can help you. I also have he same issue in round 8, I’m assuming the repeat asterisk is in the wrong place. This is beautiful! 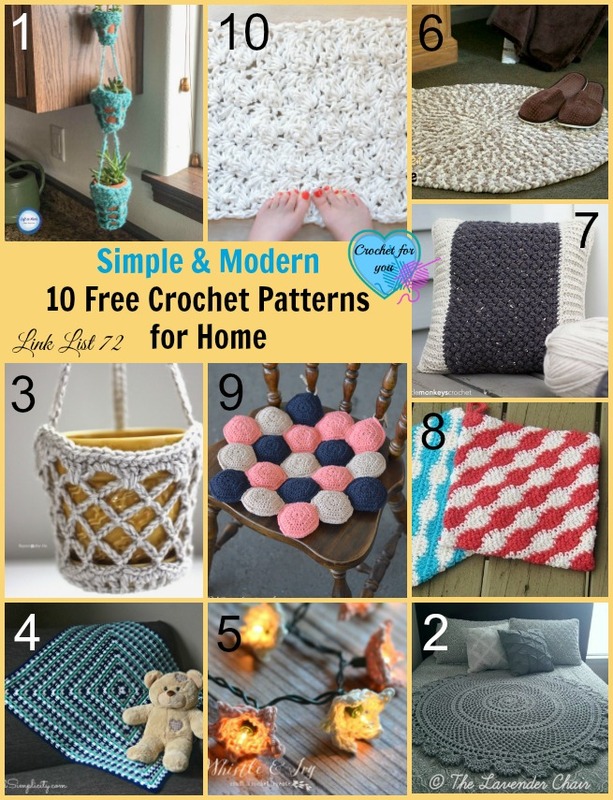 It reminds me so much of the kinds of things my Grandmother used to crochet! Funny though…. none of her kids or grandkids learn to crochet from her! Wish I would have known better back then…. but I was also only 9 when she passed away! 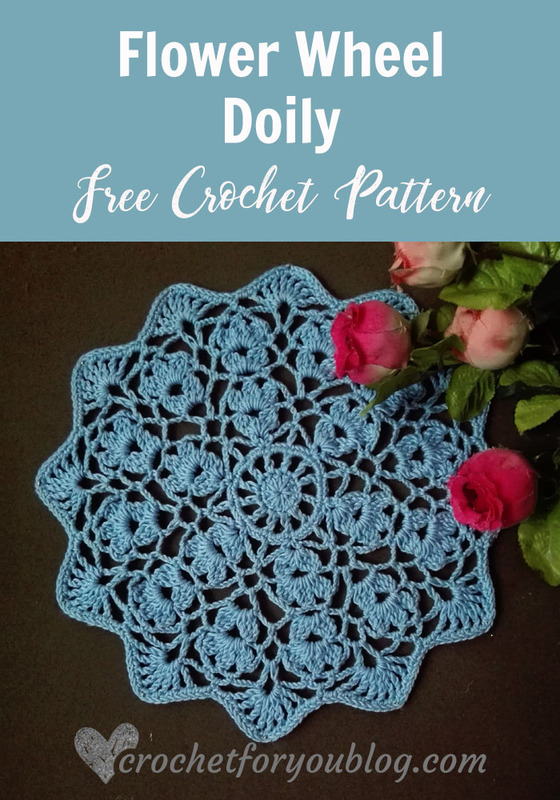 I need to give doily a try soon. Thanks for the pattern! This is beautiful, I’ll probably make it with more than one color! Your gauge does not state what “23 dc x 9 rows with 3 mm crochet hook” equals! Fixed and updated. 🙂 23 dc x 9 rows = 4″ with 3 mm crochet hook. Thank you for letting me know about it. Scratch that, I got it! Your pattern is beautiful but I’m confused on Row 5: “ch 1, sl st into the loop, (beg tr-puff, ch 4, tr-puff) in same loop”. Should the tr puff in both places be 3-Tr puff? Hi Marilyn, It is a typo, I’ll fix it and update. 🙂 It should be correct as (Beg 3-Tr puff beg, ch 4, 3-Tr puff) in the same loop. Thank you for letting me know about it. I am having trouble with row 11. It seems like the ch. 2 isn’t enough to go over the ch. 5 space so it makes it bunch up to much. And should the sl st at the beginning be a single crochet? 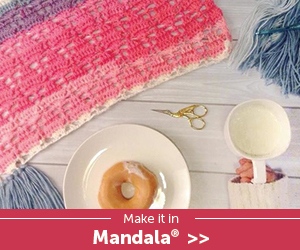 Did you crochet the fan stitch in ch-5 space? I think you missed it. 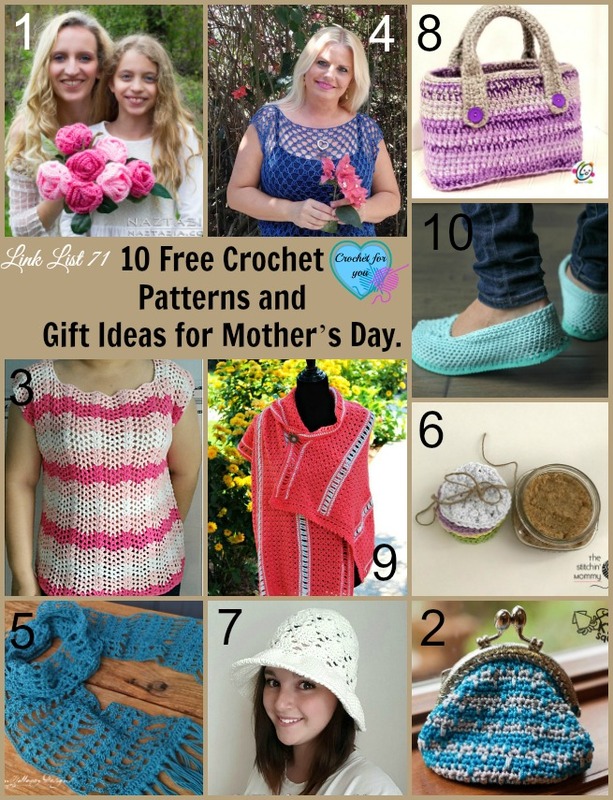 See special stitches for how to crochet fan stitch and the beg ch 1 count as first sc in round 11.